Our Geotechnical Engineering Tests allow you to experience an online examination in the real-time environment. In every online test on Geotechnical Engineering, you will be presented with Multiple Choice Questions (MCQs) which will test your skills in Geotechnical Engineering Concepts in a detailed and comprehensive manner. In the test, each question will have 4 options to choose from. You should select only 1 correct option as an answer and then move on to the next question. Once you submit answers to all the questions, you will be given your final test score. In the Online Geotechnical Engineering Test, for every correct answer, you will be given 2 points. There will also be negative marking of -1 for every wrong answer. So, you will have to be more careful in choosing the answers to the question in your online examination. If needed, you should skip to the next question and come back to the previous question later so that you can do proper time management for the online mock tests. 1. "Geotechnical Engineering Practice Tests" - In Geotechnical Engineering practice tests, there will be a series of practice tests wherein you can test your Geotechnical Engineering concepts on every chapter separately. There will not be any time limit on these tests. So, Geotechnical Engineering Practice Tests should be the first set of tests which you should attempt. Goto these practice tests here. 2. 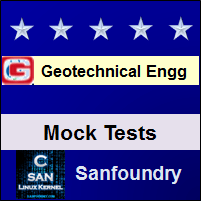 "Geotechnical Engineering Mock Tests" - In Geotechnical Engineering mock tests, there will be a series of mock tests wherein you can test your Geotechnical Engineering concepts on every chapter separately, but there will be a fixed time limit per test. So, it is similar to Geotechnical Engineering Practice Tests, but with an added constraint of time limits. You should try Geotechnical Engineering Mock Tests if you are appearing for any online examination soon. Goto these mock tests here. 3. 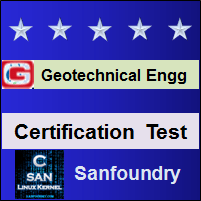 "Geotechnical Engineering Certification Test" - Once you are through with your Geotechnical Engineering concepts, then you should try our Geotechnical Engineering Certification Test wherein Sanfoundry will issue a free Certificate to you if you scored either Grade A* or Grade A in Geotechnical Engineering Certification Test. Goto Geotechnical Engineering Certification test here. 4. "Geotechnical Engineering Internship Test" - If you are interested to do Internships in Geotechnical Engineering at Sanfoundry, then you must take our Geotechnical Engineering Internship Test. 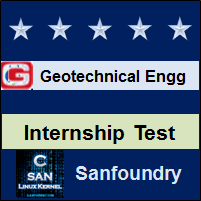 If you scored either Grade A* or Grade A in Geotechnical Engineering Internship Test, then you are eligible for Internship at Sanfoundry in Geotechnical Engineering. Goto Geotechnical Engineering Internship test here. 5. 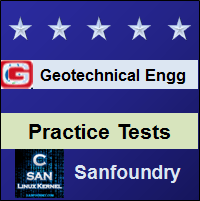 "Geotechnical Engineering Job Test" - If you are a fresher, a dropout, an experienced person and if you know Geotechnical Engineering well and looking out for jobs in Geotechnical Engineering domain at Sanfoundry (or our Network of Companies), then you should try and qualify our "Geotechnical Engineering Job Test". 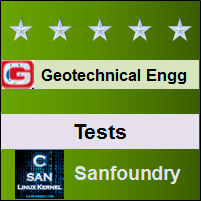 If you scored either Grade A* or Grade A in Geotechnical Engineering Job Test, then you are eligible for a Job at Sanfoundry (or our Network) in Geotechnical Engineering domain. Goto Geotechnical Engineering Job test here. For every "Geotechnical Engineering Practice Test", Total Questions: 20, Total Time: Unlimited. For every "Geotechnical Engineering Mock Test", Total Questions: 20, Total Time: 20 Minutes. For "Geotechnical Engineering Certification Test", Total Questions: 50, Total Time: 1 hour. For "Geotechnical Engineering Internship Test", Total Questions: 50, Total Time: 1 hour. For "Geotechnical Engineering Job Test", Total Questions: 50, Total Time: 1 hour. Before you get started on these series of online tests on Geotechnical Engineering, you should learn, study and practice our collection of 1000 MCQs (Multiple Choice Questions and Answers) on Geotechnical Engineering here. We also prefer that you should practice Geotechnical Engineering practice tests and mock tests completely before attempting the certification test. Here is the list of online practice tests and mock tests on Geotechnical Engineering. Each online test focuses on a "Specific chapter of Geotechnical Engineering". So, you should try both practice test and mock test on every chapter to do a self-assessment of your knowledge (along with time-limit constraints) in every area or sub-topic of Geotechnical Engineering. Geotechnical Engineering Certification test, Internship test, and Job Test are mentioned at the end of this list. 1. Geotechnical Engineering Test 1 – This set of online test on “Geotechnical Engineering” tests your skills on Sedimentation Analysis, Pipette Method, Hydrometer Method, Particle Size Distribution Curve, Consistency of Soils, Determination of Liquid and Plastic Limit, Shrinkage Limit, Activity of Clays, Collapsible Soils, Specific Surface. 2. Geotechnical Engineering Test 2 – This set of online test on “Geotechnical Engineering” tests your skills on Particle Size Classification, Textural Classification, Unified Soil Classification, Indian Standard Classification, Soil Structure, Solid Particles in Soil, Atomic and Molecule Bonds, Interparticle Force in a Soil Mass, Single Grained and Honey Comb Structure, Clay Minerals. 3. Geotechnical Engineering Test 3 – This set of online test on “Geotechnical Engineering” tests your skills on Modes of Occurences of Water in Soil, Capillary Water, Capillary Tension, Capillary Potential and Soil Suction, Shrinkage and Swelling of Soil, Frost Action, Stress Condition in Soil : Effective and Actual Pressure, Darcy's Law, Factors Affecting Permeability, Determination of Coefficient of Permeability. 4. Geotechnical Engineering Test 4 – This set of online test on “Geotechnical Engineering” tests your skills on Constant and Falling Head Permeability Test, The Jodhpur Permeameter, The Capillarity – Permeability Test, Steady Flow to a Well : Dupuit's Theory, Flow Towards a Well:Recuperation Test, Two Dimensional Flow : Laplace Equation, Application of Flow Net, Phreatic Line of an Earth Dam, Khosla's Theory, Well Point System, Seepage Analysis. 5. Geotechnical Engineering Test 5 – This set of online test on “Geotechnical Engineering” tests your skills on Protective Filters, Standard Proctor Test, Field Compaction Test, Factors Affecting Compaction, Effect of Compaction on Soil Properties, Mohrs Stress Circle, Mohr – Coulomb Failure Theory, Direct Shear Test, Tri-axial Compression Test, Unconfined Compression Test. 6. Geotechnical Engineering Test 6 – This set of online test on “Geotechnical Engineering” tests your skills on Shear Strength of Cohesive Soil, The Mohr – Colomb Failure Envelope, Plastic Equilibrium in Soils : Active and Passive States, Active Earth Pressure: Rankine’s Theory, Coulomb’s Wedge Theory, Culmann’s Graphical Method for Active Pressure, Stress Distribution in the Vicinity of Shafts, Classes of Underground Conduits, Load on Positive and Negative Projecting Conduits, Stability Analysis of Infinite Slopes, Stability Analysis of Finite Slopes. 7. Geotechnical Engineering Test 7 – This set of online test on “Geotechnical Engineering” tests your skills on The Swedish Slip Circle Method, Friction Circle Method, Taylor's Stability Number and Curves, Minimum Depth of Foundation: Rankine’s Analysis, Types of Bearing Capacity Failures, Terzaghi's Analysis, General Bearing Capacity Equation: Brinch Hansen’s Analysis, Effect of Water Table on Bearing Capacity, IS Code Method for Computing Bearing Capacity. 8. Geotechnical Engineering Test 8 – This set of online test on “Geotechnical Engineering” tests your skills on Plate Load Test, Standard Penetration Test, Permissible Total and Differential Settlements, Types of Foundation, Settlement of Footings, Combined Footing and Strap Footing, Mat or Raft Footing, IS Code of Practice for Design of Raft Foundations, Types of Piles, Load Carrying Capacity of Piles. 9. Geotechnical Engineering Test 9 – This set of online test on “Geotechnical Engineering” tests your skills on Pile Load Tests, Group Action in Piles, Under-Reamed Pile Foundations, Construction of Under-Reamed Pile Foundation, Cased Cast-in-Situ Concrete Piles, Uncased Cast-in-Situ Concrete Piles, Bored Piles, Shapes of Wells and Component Parts, Analysis of Well Foundation, Well Curb, Cutting Edge, Steining and Bottom Plug. 10. Geotechnical Engineering Test 10 – This set of online test on “Geotechnical Engineering” tests your skills on Well Sinking, Pneumatic Caissons, The Mass Spring System, Barken’s Method, Dynamic Analysis of Block Foundations, Types of Pavement, Mechanical Stabilisation, Site Exploration, Method of Site Exploration. 11. Geotechnical Engineering Certification Test - This set of online free certification test on "Geotechnical Engineering" tests your skills on all areas (all chapters, topics and subtopics) of Geotechnical Engineering. 12. Geotechnical Engineering Internship Test - If you scored either Grade A* or Grade A in our Geotechnical Engineering Internship Test, then you can apply for Internship at Sanfoundry in Geotechnical Engineering. 13. 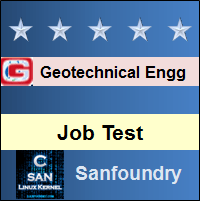 Geotechnical Engineering Job Test - If you scored either Grade A* or Grade A in our Geotechnical Engineering Job Test, then you can apply for Jobs at Sanfoundry in Geotechnical Engineering domain. Best Wishes for your Geotechnical Engineering Tests!